buster (or bustard), our adoption kitty, is alive and doing very well. we thought his growth would be permanantly stunted, and that he would forever be a small cat, but he is catching up with the older kittens, and looks like he will be a huge tom cat.his head and paws are already larger than theirs. he is planning to travel to virginia with lexi and bear when they come through on their way back from california. you can read buster's story here. here is gigi (the wonder cat), feeding him in the box she would take him to alone, so that he could get a chance to eat without competition fromt eh bigger kittens. and here he is with the other kittens. our kittens are over 3 weeks old now, and so, so fun. they want to explore and play with us and wrestle each other. we have always felt that gigi, their mommy, is the best little kitty cat in the entire world (she found lexi & i as a tiny ktten when we went for a walk last summer, and wanted to come home with us), and she has proved to be a wonderful mother ~ staying in her box and nursing her babies even when she was weak from hunger. we would bring food & water to her, and she would gobble it desperately, but she wouldn't leave her babies. on monday, the day after their 3 week birthday, a cute little neighbor boy brought us a tiny gray kitty he had found in their barn. they heard it crying on sunday, but couldn't find it. he finally searched until he found it in the rafters after school on monday. it was so tiny, about 1/4 to 1/3 the size of our kittens. so we force fed him some milk through a syringe, worried that he would get it into his airways, and decided it would take a miracle for him to make it through the night. little mia is our animal lover and she put him in a doll sling and carried him around that evening. she lovingly and patiently cared for him and kept trying to feed him. "please check on buster (that's what she named him) every 30 minutes"
we wrote that he was alive at midnight and went to bed. in the morning he was alive and willing to be fed more milk from a syringe. mia took buster to gigi before she left for school, and had a long talk with her, telling her how important it was for her to feed him. gigi listened and then picked him up by the scruff of his neck...it took her a long time to accomplish it, because there isn't much scruff. it looked like she was eating him....and carried him to an empty cardboard box in the garage and let him nurse. then she carried him back to the box with the other kittens. she has repeated this over and over and will take him to his own box whenever we ask her to. now, wednesday afternoon, he can hold his own and feed with the other kittens. i don't believe in coincidences, but do believe that most (if not all) things happen for a reason. i wondered if this little kitty may have been sent to us for a reason. i asked mia what she and buster (pronounced "bustard" by gracie, which inspires endless amusement) have in common. she noted that they were both small. i contributed that they both had birth mothers that couldn't take care of them for some reason. then i asked if we, or gigi, love him any less because he is a different color, or different size, or was born to a different mother. i saw the light go on in her eyes that i had hoped for. and that brings me joy. she struggles with these issues. i'm grateful for an orphaned kitten and a devoted kitty mother and what they can teach my precious little girl. i love to sew for my kids, and i can dream up endless opporutnites to sew for my girls, but very few for my little boy, especially as he gets older. one little man can only wear so many different pairs of pajamas. so i was delighted to find this pattern for "little guy ties" by "my little londyn". i easgerly started sewing them, and couldn't stop. my little guy is not the proud owner of 4 little ties, his dad has a matching tie, and we've also made one for a friend. i keep thinking of new fabrics that would be perfect to use. his old ties were stained and snagged. i love that these are more washable and un-snag-able. i thought he would like thing 1 & thing 2 the best, as they fit his personality so well, but excitedly picked out a print called "japanese words"
as his favorite. i asked him why he liked it...."i like the way i feel when i look at it". (he is japanese). mia is 8 today. she was born on tax day, but it wasn't tax day in japan. the 15th was easter that year, everywhere. easter isn't celebrated in japan, but it was celebrated by us, a particularly happy and memorable easter that year, and three days later we got a phone call about a healthy, genki (happy) baby girl....did we want her? ummmm, YES! we had to think about it for approximately .0000001 nanoseconds. it was pure magic, an easter miracle, and it still is. on friday we cut off her 12 inch ponytail of beautiful hair to donate to locks of love. she had a bit of a panic when the ponytail came off. but i just love her new look, the way her hair frames her sweet face. and it's wonderful to be freed from the brushing and brushing and washing and washing.....painful for both her and i.
we have been treated to a 5 day visit by one of our most favorite of people in the world, shingo. the first time i saw shingo, he was a missionary, singing a musical number in church with a large group of young missionaries. when i saw him, i knew that our plans to move back to the u.s. after receiving mia's visa from the u.s. government needed to change. the spirit told me strongly that i had a son like shingo coming, and i needed to stay in japan and find him. it was an overwhelming experience, unlike any i had ever had, and it changed everything. shingo was serving as a missionary in the ward that shared our building, and so we had the opportunity to get to know him. he loved mia, who was 17 months old, and we discovered that his family was best friends with dr. samejima's family (the doctor who gave us mia). shingo had left medical school to serve his mission and planned to work with dr. samejima after he graduated (medical school begins right after high school in japan). after this experience, and a few others i won't take the space to list, we called dr. samejima, and although we felt tremendously selfish and brazen in asking for another baby when so many other families were waiting, we found the courage to say that if he ever had a baby that he couldn't place for any reason (racial mix, handicaps, etc) to please let us know. he laughed and said there was another baby for us, a boy, and he would find him. if we were to adopt again, and pass the u.s. home studies required, we needed to move out of our one bedroom home in tokyo. we felt guided to move to maihama, just outside of tokyo, and walking distance from tokyo disneyland and disney sea. and we did so about a month and a half after meeting shingo. and to our surprise, in our new japanese ward (we had spent the last 7 1/2 years in an english ward), we met shingo's family who lived just blocks away from our new home. we loved them immediately. there is so much i could write, but to keep it simpler, 18 months after meeting shingo, i received a phone call that woke me early on a sunday morning. brock was gone, already at early church meetings. dr. smaejima's voice said "omedeto" (congratulations), "i've found your baby". it was march 7, 2004, the day of shingo's mission homecoming. we celebrated that day for two joyful reasons. and at shingo's openhouse that evening, sister samejima met with us and told us all about noah's birth mother. in april shingo went back to medical school and noah was born. these two (noah & shingo) are intricately tied together, and although i don't completely understand it, i know that it is significant. the spirit tells me so. we've seen very little of shingo since, as his medical school was in tokushima, shikoku, far away from tokyo...and nauvoo. i was thrilled to answer the phone in early december and hear shingo's voice. he would be graduating from med school in march, and would like to come and visit us then. we've been eagerly anticipating his visit, and it was even more enjoyable than hoped. he is amazing, and brought a wonderful spirit to our home. we hope that noah will be as much like him (as the spirit whispered to me) as possible....they look remarkably alike. it was a painful farewell when we put shingo on the train back to chicago. but he promises to visit before too long with his "new family" (the family he plans to have). we'll be waiting. saturday we realized that it was the 5 year aniversary of the day of shingo's homecoming, and we were all together again. watching noah's face as he gets on the school bus, and gets off again when arriving home - happiness! alone time with gracie while noah is at school - so fun to sit and play with her! she is a sweet & tender mommy to her baby dollies. hanging out with the rodenbergs, and driving along the mississippi and through cornfields to get to their home. early morning seminary - i wasn't looking forward to this, just the opposite. but, (so far) it seems to be helping my girls to be more centered, and i love that they are more motivated to settle down and go to bed on time, rather than staying up and playing on facebook, etc. my family - in the last week three airplane crashes have injured and claimed the lives of people i know or know of - one crash in guatemala and two in the western u.s. a new father who died had just blessed his newborn daughter. another couple died, leaving three teenagers without parents, and yet another couple with four tiny children survived, but are severely burned. and another family i know, who has faced many struggles, has lost their father to cancer. many mre died & were burned in these three crashes, whose stories i don't know, but i'm sure are just as compelling. i am feeling blessed & grateful to have my family with me, and to be here with them - we never know when that may change. "you know i can't resist commenting on your infertility postings. i relate to all of it so intensely. and everything you said is beautifully true..."the best food ever tastes is after a fast. the best water ever feels going down your throat is when you are parched. and i know someday when i am holding a newborn in my arms the feelings of joy will be magnified for all the waiting and struggling. it will be just another blessing of infertility." when we finally got mia, i was so grateful for my infertility, because it made the wonder & magic of that miracle so much more intensely perfect. and about enjoying cate.... i remember well watching 5 year old natasha run on the play ground while we waited for lexi to get out of school one afternoon, during my infertility years, and being overcome with the wonder and miracle that she was in my life, and being grateful. it took me longer to get to that point (and have a peaceful and compelling desire to find my child) than brock. i'm not trying to say that you will definitely get there, nor am i recommending that you eventually adopt. it's just a thought....it may be right for you someday, or it may not." thank you kelly for reminding us of another reason that our families are to be cherished now and at every opportunity. i could also make a list of the things i would change about my life right now, but those things are all overshadowed by my grateful list. and really, i should be most grateful for the things i would change, because they offer me the greatest opportunities for growth. this is an interesting few weeks for me. as we are packing up and saying goodbyes, we are also reuniting and saying hellos to friends we haven't seen for years & years. we had two reunions over the weekend. our moving truck pulls away one week from today. and we have two more reunions before we leave twelve days from now. i'm so grateful that we get to see people before we leave. not only is it wonderful fun, but it keeps our life from being completely consumed by boxes. on monday we got together with friends from our english ward in tokyo. our friendships there have been some of the most amazing of our lives. when we made the decision to move to japan 13 years ago.... in fact, we were in tokyo for brock to interview for that job 13 years ago this week, as he was graudating from grad school.... we expected to have amazing cultural experiences and make lots of japanese friends. what we didn't expect was the incredible bond we would form with the member of our english speaking ward. we didn't even plan to go to an english speaking ward, but after a few weeks of complete japanese submersion, i realized that i needed to be able to speak english, at least on sunday. after 7 1/2 years in our english ward (probably the happiest time in our life so far - lexi & tashi think so too), we did make the move to a japanese ward, which became a branch, and then became a ward again. that was an amazing experience too, in different ways. i guess something about being in a foreign culture with a foreign language and having no family in the same hemisphere helps people to to appreciate each other. we needed each other, and we would do anything to help each other. i learned from example how to really serve and really love, how to really share the gospel, and really fellowship, and how to really be a friend in this ward - from the examples of these friends. and i learned how to overcome cultural and language barriers. at one point we had people from 13 different countries, who spoke 10 different native languages in this ward. members traveled (by car, bus, or train) up to an hour and a half to get to church, and up to two hours to do visiting and home teaching. people sacrificed for each other and for their testimonies. but it was more that just the need for each other. the people in this ward were exceptional, some of the best people i have had the privilege of meeting. truly. and i love them. to me the most amazing thing is that we can get together with these friends, no matter how much time has passed - 1, 6, or even 9 years, and pick up again where we left off like no time has passed, nothing has changed - except our kids getting older. some of us are still in japan, some have been in thailand, england, taiwan, turkey, canada, and many are back in the u.s. it doesn't matter where are are or what we have been doing, we still connect and understand each other. we have known most of these teenagers since they were in nursery & sunbeams with lex & tash. it was so fun to see them back together again. even if our life in japan hadn't been an amazing experience, and we hadn't gotten our mia & noah.... even if i hadn't loved japanese people & culture (most of it anyway), i would still be grateful for japan just for these friendships that we have made. these girls were my lifeline. and the memories are so fun.....crazy karaoke, train trips, scrapboking while our kids played, costco shopping (american food at close to american prices = heaven), trips to hong kong, etc. if only more of the girls could have been there with us. five of my blog links (to the right) are bloggers from this ward: gloria, jeni, mary, mcintyres, & val. only val is in the picture above. seeing the hansens & their two oldest (plus nick, who jumped in the photo - dang you nick! :) ) was a highlight! we haven't seen them since we visited them in nagoya nine years ago this week, and celebrated the 4th of july & parker's 7th birthday with them. they have stayed at our home (two different homes in Japan) twice since then, but both times we were in the u.s. and didn't get to see them. the second time they stayed in our home they were on their way to live in thailand. their kids were lexi & tashi's first friends in japan. tashi wanted to marry parker. i told her it was ok with me. another highlight was when friends who were in this stake, but not this ward, stopped by because they saw the "tokyo reunion" sign posted. they adopted a japanese son that is lexi's age. i had long talks with them about how they adopted in japan, and it was such a "fluke" (blessing) that they had gotten that baby, that i feared it could never happen for us. the agency they worked with wouldn't even work with us because we were "too young" (still in my 20's) and already had two kids. but it did work out. it was wonderful to see them! 1. jogging with lexi & tashi - so much funner than doing it alone! 2. the new york city ballet workout. if you can't find a ballet class, this is the next best thing. 4. best of tamilee web - again, great workouts for abs, buns, and arms. this is a brand new one, and i'm enjoying it because i have done #3 so many times and needed something new. 5. island girl hula cardio dance workout - when you want the beach, but can't be there. tashi & i enjoy doing this one together. i also have a belly dancing workout that i want to try, but haven't yet. yesterday was tax day, and mia's birthday. seven years of mia's smiles, laughter, and silly sweetness. read more about the day mia was born on this post , & her adoption here, & more about mia here & here. 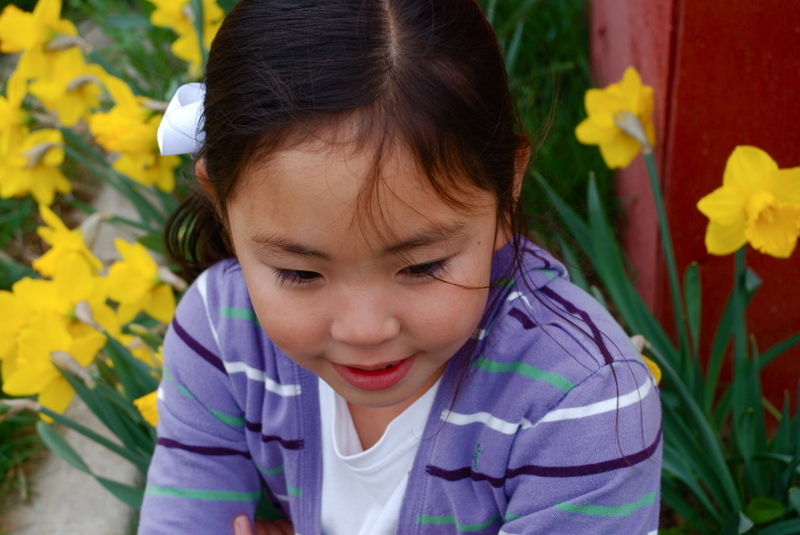 the yard is bursting with daffodils, and we had a photo shoot in spite of a freezing wind. lexi & tashi had a track meet in the terrible weather. lex took 2nd in the 1600, and tash took 3rd in the 400, and i ran out of battery and didn't get any photos at the meet. 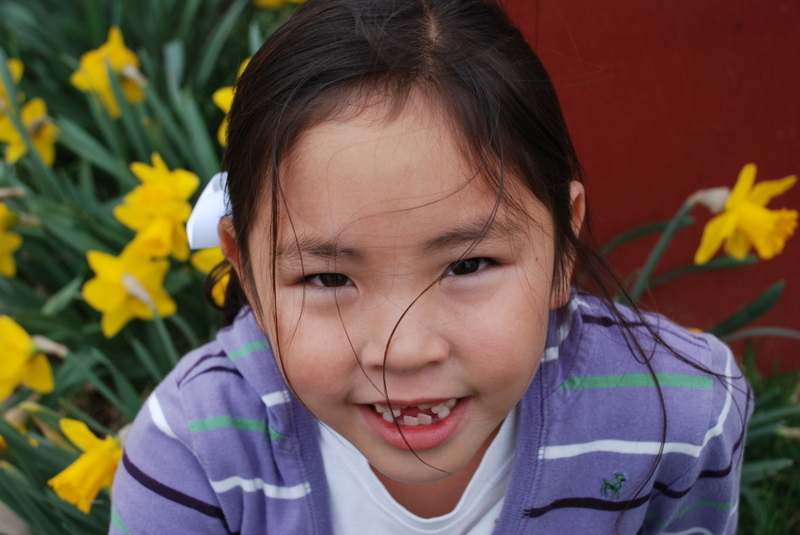 we are grateful for this girl!.....and love the missing front teeth.